Fort Wayne, Ind.—Indiana Tech announced today that the university’s new entrepreneur center, the Center for Creative Collaboration (the C3) is now open. The C3 will provide entrepreneurs with rapid, targeted, and effective assistance in all phases of business startup, operation, and growth. 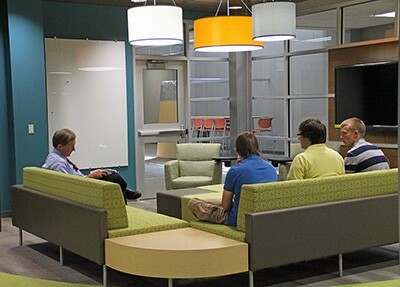 The C3, located in Indiana Tech’s new Academic Center on its main campus in Fort Wayne, will assist clients by matching their needs with an experienced team of Indiana Tech faculty and staff from across the university, along with business mentors from around the region. The process for each client starts with an assessment of their business concept and its potential for success and growth in its particular marketplace. From there, the C3 project team and the client collaborate on developing and implementing the plan that will carry the client’s business forward. The C3 is unique in that its client service teams are drawn from both the university and the business community at-large. Indiana Tech faculty and staff from all four the university’s colleges – business, engineering, general studies, and law – serve on client project teams based on the needs of the client. From the wider community, the C3 recruits client mentors with wide-ranging experience. C3 mentors have started their own businesses, managed large operations, served in community and economic development organizations, provided venture funding to startups, and much more. For more information on the C3, please contact Mark Richter at 260.399.2816, mhrichter@indianatech.edu, or visit www.theC3.com.